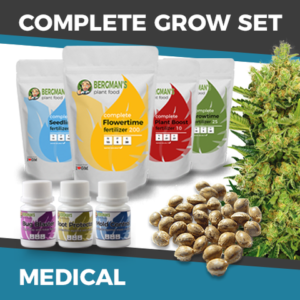 Containing all you need to cultivate your own medical marijuana, this complete grow set is one of our best sellers across the USA. With many states now permitting the growing of a limited number of marijuana plants for medical purposes, a lot of people are beginning to cultivate plants that wouldn’t have considered it before. With a variety of complete Grow Sets, each containing a different marijuana strain, choose the set that suits your needs, tastes and preferences best. Each complete set contains the highest quality seeds, feeds and protection compounds your plants will need to produce the best possible harvest. Containing 20 high quality feminized seeds, guaranteed to germinate and produce the finest female plants, simply add pots and a suitable growing medium to begin growing your own, medical marijuana plants today. 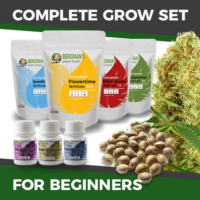 Supplied with all the nutrients your plants will need, each complete grow set comes with four, dry formula compounds covering a different stage of the plants development, from seedling through to maturity. With enough feed to grow twenty, large plants, simply follow the feeding instructions and schedule to produce a successful harvest. Good, reliable information is paramount to success in anything you may wish to achieve, and growing marijuana is no different. Download the free, no obligation Growing Marijuana Guide and learn how to maximize your plants yield and potency with sections covering all aspects of growing, both indoor and outside. You can buy the Medical Marijuana Seeds Complete Set, containing the seeds, nutrients and plant protection needed to produce a successful crop here. Take the guesswork out of growing marijuana, with all the help, advice and assistance you may need. Cheese seeds are one of the most commonly grown strains of Cannabis in England and the UK. The strain was born from a rogue seed found in a packet of Sensi Seeds Skunk No#1 and had such a unique and pungent aroma, it quickly become popular with many English Skunk Cannabis smokers during the late 1980’s. Named after it’s strong, pungent aroma, Cheese marijuana seeds are often referred to as medical marijuana due to its reduced THC level and elevated CBD content. An easy strain to grow and perfectly adapted to growing both indoors and outside during the growing season. Originally a rogue seed from a packet of Skunk#1, Cheese marijuana has become highly popular across the world, gaining popularity for its unique aroma and flavor. A hybrid strain, it contains 60% Indica and 40% Sativa genetics, producing a dense, squat, bushy plant with multiple budding sites, perfect for indoor growing, providing up to 550 grams of the finest quality buds per square meter, depending upon conditions. 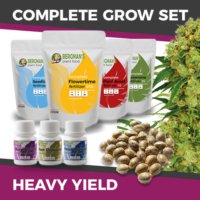 With advanced nutrient compounds and plant protection formula’s supplied with every Complete Grow Set purchased, your assured of strong, vibrant plants, heavy yields and top quality buds. Each set contains 20 guaranteed feminized seeds and all the nutrients required from germination through to harvest.